KATHMANDU, June 10: Global Policy Forum for Nepal (GPFN), the Association of Nepalis in the Americas (ANA), and Canada Foundation for Nepal (CFFN), Nepali Embassy in Ottawa and NRNA NCC of Canada are jointly organizing a conference entitled “Role of Nepali Diaspora in Higher Education in Nepal” in Toronto, Canada. According to a press statement issued by the organizers, the conference will be held at Wycliffe College, University of Toronto, Canada on July 7, 2018. 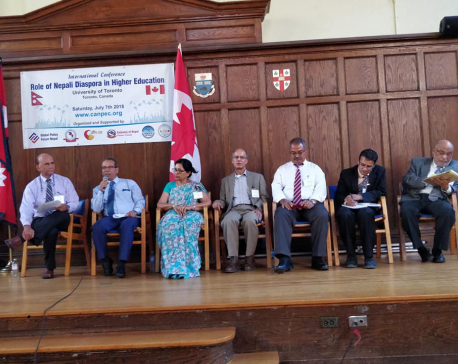 “The Toronto conference is designed to help the interested Nepali Diaspora scholars to discuss and strategize ways for the Diaspora members to be more intensely involved in higher education in Nepal,” said the press statement. Organizers said conference speakers will discuss how the Diaspora members can help in the advancement of research, management, curriculum development and distance teaching to help raise the standards of Nepal’s higher education programs. Several scholars including from Canada, USA, and Europe will be presenting their papers related to the Diaspora’s role in supporting Nepal’s higher education programs. The conference organizing committee includes Dr. Ambika P. Adhikari, Dr. Tulsi Dharel, Dr. Govinda Dahal, Mr. Naba Raj Gurung and Mr. Gopi Krishna Kafle. Confirmed speakers, according to the organizing committee, include Nepali ambassador to Canada Kali Prasad Pokharel, Canadian Federal MP Dr. Geng Tan, Prof. Surya Subedi of University of Leeds, Prof. Basu Sharma of University of New Brunswick, Prof. Jeet Joshee of California State University, Prof. Drona Rasali of University of Regina, Prof. Shiva Gautam of University of Florida, and Dr. Bidya Ranjit of University of Connecticut.